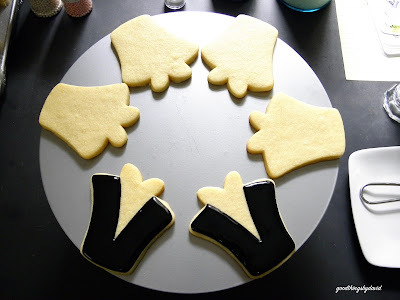 Making any type of sugar cookie decorated with royal icing requires some planning, time management, and very good ingredients. I like to begin these projects several days before the event, so that I don't run into problems. 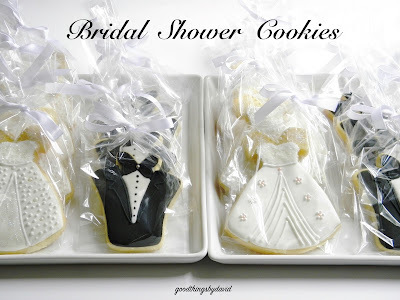 Recently, I had the pleasure of making some bridal shower cookies in the shapes of tuxedos and wedding dresses for a dear neighbor. 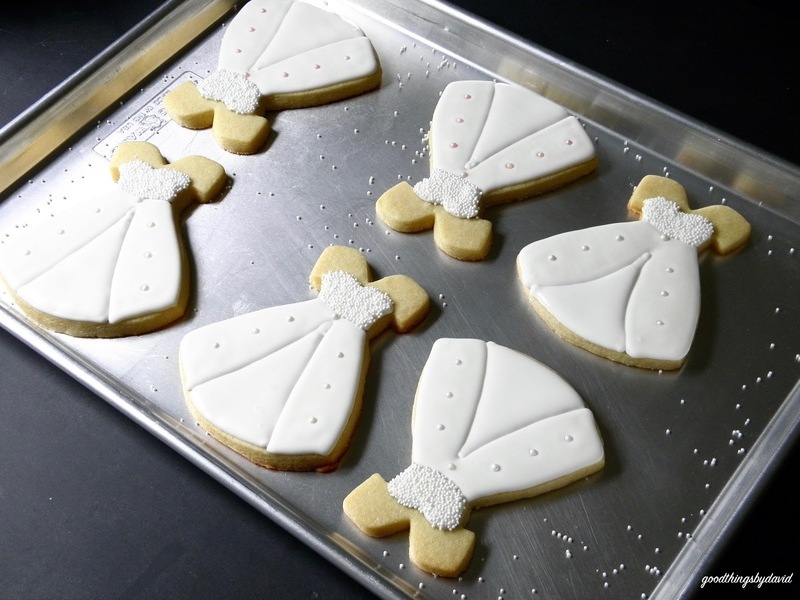 Although I have never created any wedding cookies before, I do own several cookie cutters perfect for such an occasion. The wedding dress cookie was made with a copper cutter that I purchased from a very good friend several years ago, and the tuxedo top came from a recent purchase of Sweet Sugarbelle cookie cutters at Michael's. If you don't own the shape shifters set from Sweet Sugarbelle, I highly recommend getting it because the cookie cutters lend themselves to so many things. After baking the cookies, I made several batches of royal icing in black and white. For this project, I made sure to have a flooding consistency icing, as well as a stiff royal icing in both colors. 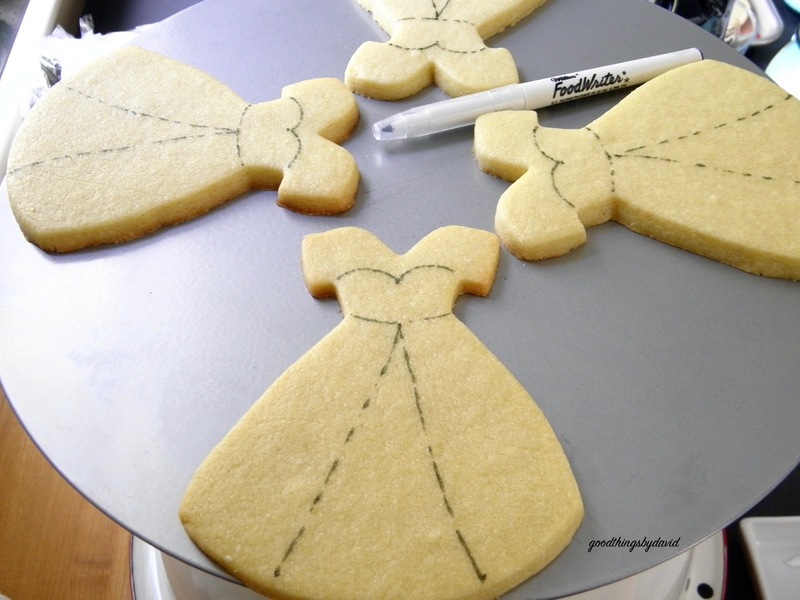 I altered the dress-shaped cookies before I even baked them. The original shape of the cookie cutter had a skirt with a scalloped bottom, so I decided to trim the scallops of the cookies using a "trim edger cutter" from that set of shape-shifters I mentioned earlier. After baking and cooling the dresses, I traced a sweetheart bodice, and a two-part skirt with a Wilton Food Writer pen. The gowns were then iced in several stages. The outside areas of some of the ball gowns were outlined and flooded in white royal icing using a #3 piping tip. I then placed either white or pink pearl candies along the centers as shown. The areas were left to dry completely. I then outlined and flooded the center areas of the skirts with the same white royal icing, and left them to dry completely. The sweetheart bodices were then outlined and flooded with white royal icing using a #2 tip, and were immediately flocked with either coarse, clear sanding sugar (for sparkly tops) or with white nonpareils (for pearly tops). The cookies were left to dry completely. Any stray sugar crystals or nonpareils were removed after the tops were dry. 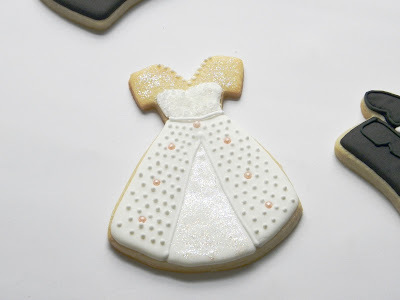 White royal icing dots were added to the neckline of the cookies with a #2 tip to create a delicate pearl necklace, and more dots were placed along the edges of the gowns as shown. The center area on some of the skirts were enhanced with a super-white edible glitter; dip a small brush into the glitter pot and carefully paint it onto the dried royal icing. The glitter won't immediately stick to the icing, but if you leave it alone, it will settle. I treated the bare areas of the cookies with the same edible glitter. Voila! 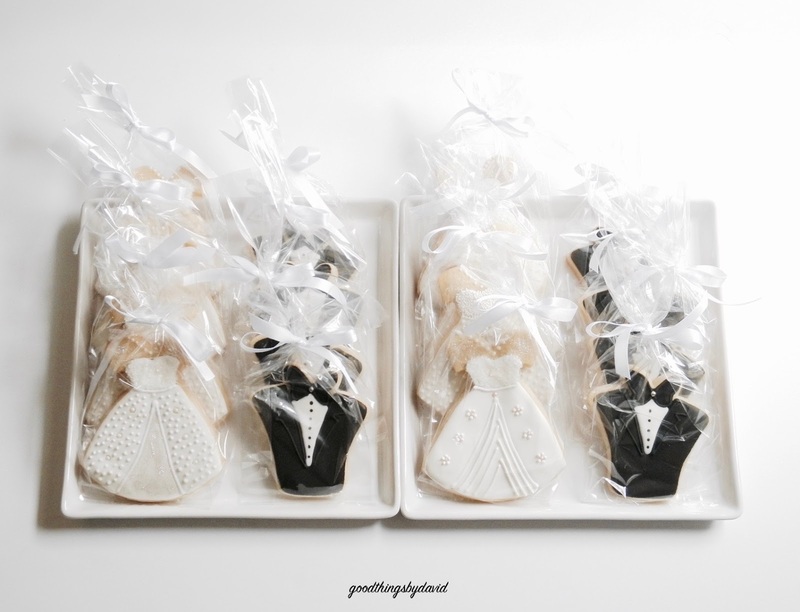 The tuxedo tops of the gentlemen were made using the adorable "gift box with ribbon" cutter from Sweet Sugarbelle. Her set of cutters comes with recipes and decorating instructions. She had a version of this tuxedo top that I fell in love with, so I used it! 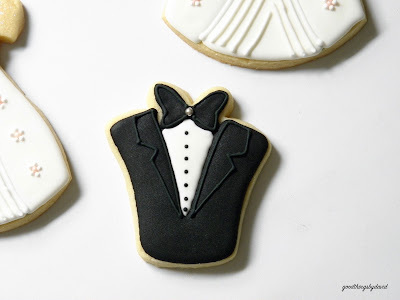 The tuxedo jacket areas were outlined and flooded with black royal icing as shown. These areas were left to dry completely. Don't they look spiffy already? 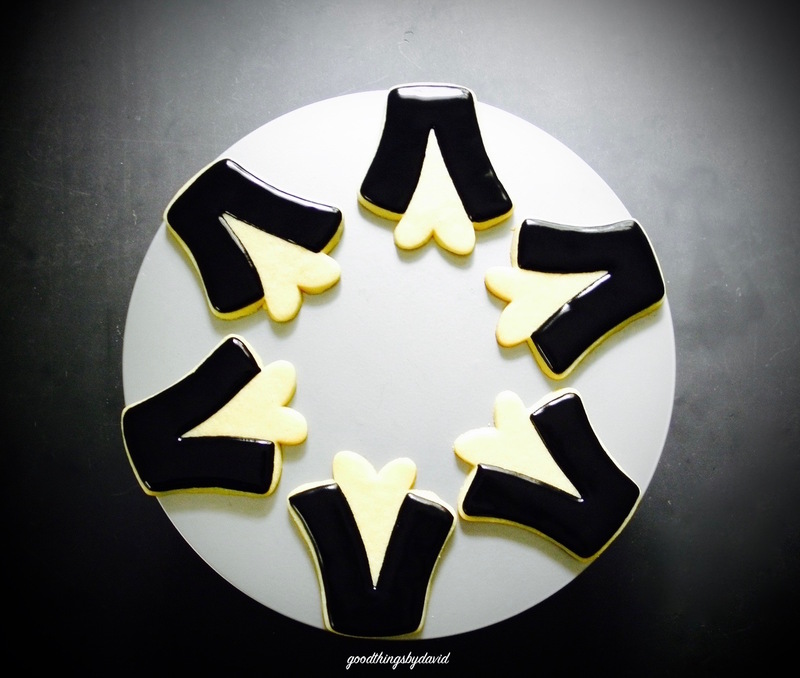 Bow ties were outlined and flooded with the same black royal icing using a #1 piping tip. A single drageé was placed in the middle of the bow tie. This area was left to dry completely. I then used a #2 piping tip and some white royal icing to fill in the shirt, and while the icing was still wet, I piped black shirt studs down the middle. The cookies were then left to dry completely. The lapels and the edges of the bow ties were piped with a #1 tip, and some black royal icing (it has to be stiff). Done! As you can see, I modified the skirts and the bodices on most of the gowns to give some variety. All of the tuxedos, though, were exactly the same. I loved the way the wedding gowns sparkled! Wrapped in clear cellophane bags and tied with white ribbons, the Bridal Shower Cookies were ready to be placed on platters for gift-giving. It's a certainty that you will know of a bride-to-be in the near future. 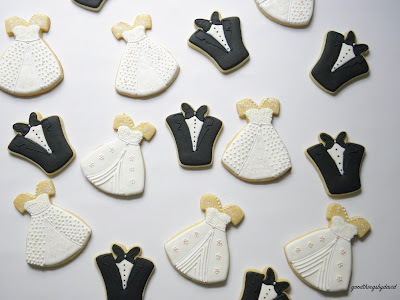 If you happen to be adept at making royal icing cookies, consider making a set of cookies for a bridal shower. Use these cookies as a guide or create your very own edible works of art. 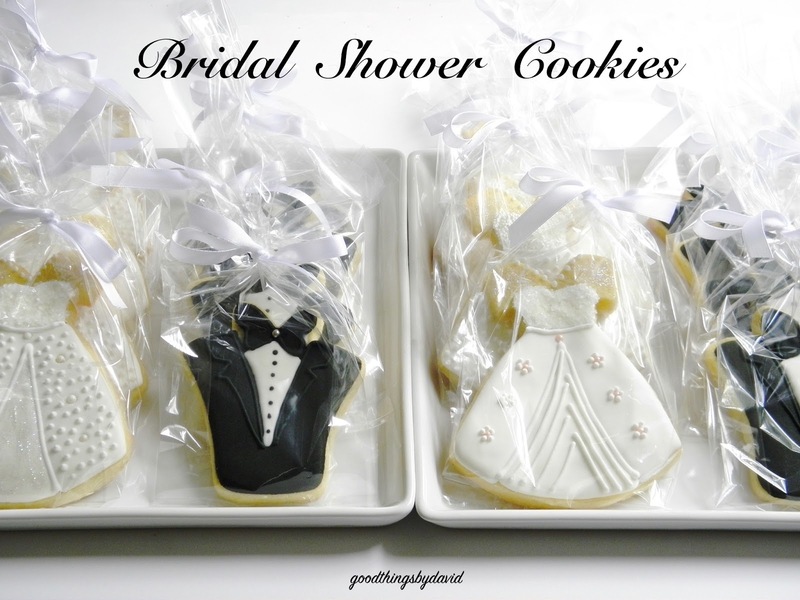 Make sure that you make a cookie for everyone attending the bridal shower. In fact, make extras just in case.